Update, January 2017: With the new MagicBand 2.0, which has a different form factor than the original iteration used in this post, some of this information (like the template we used) will be out of date. 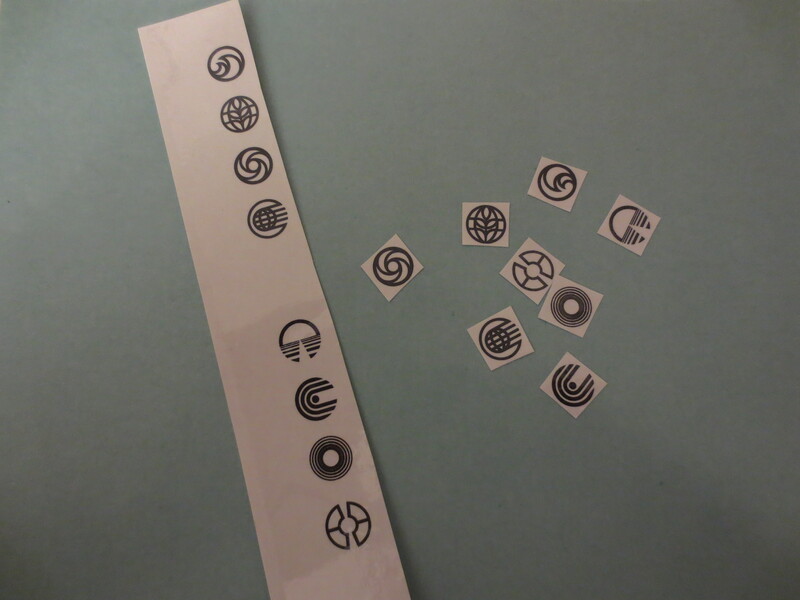 However, the basic techniques–using temporary tattoo paper–should still work regardless. You’ll just have to modify your designs to take into account the removable puck in the center, so something with two halves (or a few smaller bits) would work whereas one complete band design probably wouldn’t be feasible. It’s arts and crafts time, kids! As soon as my wife and I booked our trip to Walt Disney World, we knew that we wanted to decorate our MagicBands. Sure, you can buy covers and charms and such in order to add some flair to the bands, but we wanted to turn ours into unique art projects. Not only was this a way to show off our fandom and have some fun, but we had heard that cast members frequently notice and appreciate custom-decorated MagicBands. So today I’m going to share the adventure of making this happen. Decorating a MagicBand can take some work and (in our case) some trial and error, and the thought process should really start before you even have the band. Once you book your Disney hotel, you’ve got a limited amount of time in which to pick the color of your MagicBand (from a small selection) before they process the order and send it out. You may want to consider your decoration concept in advance so you can match the band color to your plan. Not only do you want to go with a color that complements your art, but it can even help correct some problems (as you’ll see in a bit). We each considered a few different color options as our ideas changed and evolved (I originally chose the orange band and was considering a Haunted Mansion theme). We finally settled on these as we felt they best complemented how we wanted to decorate them. 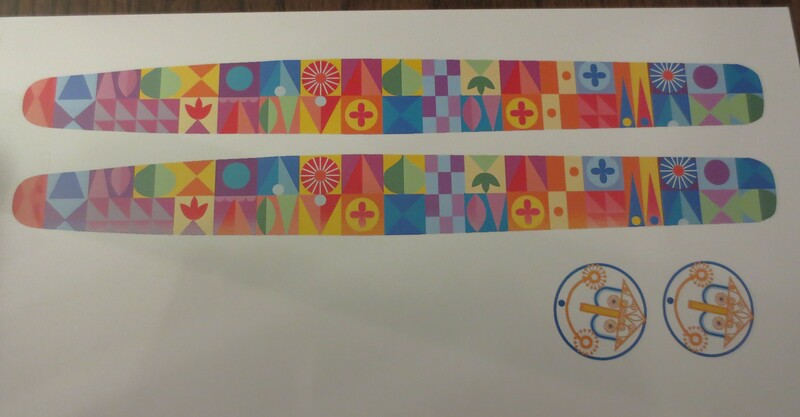 Before our MagicBands had even been shipped, we had our design plans: Gilly was covering hers in an “it’s a small world” themed pattern, while I was going to adorn mine with the original EPCOT Center attraction logos. So while we were waiting for the bands to arrive, we worked on how we wanted to make this all happen. 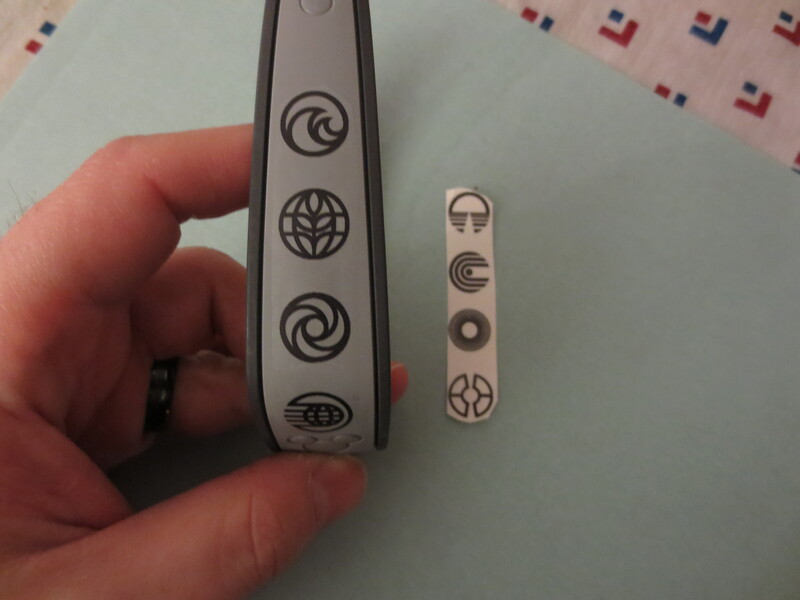 The first thing we did once the MagicBands arrived (after oohing and aahing over them for a moment or three) was take measurements so we could print out the designs accordingly. This was a little challenging due to the shape of the bands, but we got pretty close. Also, part of the band is surprisingly inflexible and oddly shaped (in particular around the center, where all that magic is stored). We actually put a piece of clear packing tape over the band and traced it with a marker, then peeled the tape off and laid that down flat on a piece of paper and scanned it into the computer. 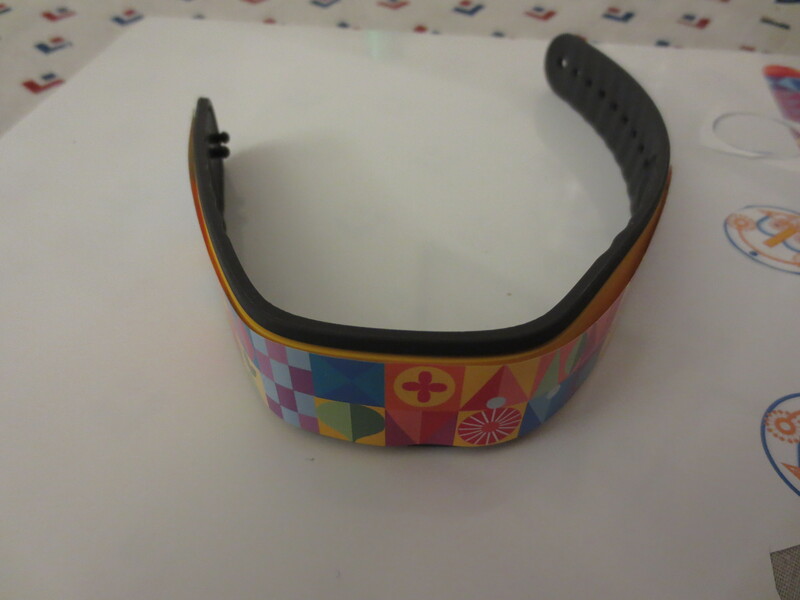 From there we used a tape measure, measuring from several angles, and adjusted the scanned template in Adobe Illustrator to work up a reasonably exact mock-up of the MagicBand. It was extremely difficult to get really accurate measurements, particularly around the curved top and bottom of the colored area. The MagicBand has a weird shape, particularly around the center where the tech is housed, and as a result the surface area isn’t flat. Also, we couldn’t find our fabric tape measure and we were using a regular metal one, which didn’t help. In addition to the MagicBands and our printed designs, we also had some other supplies ready: clear nail polish and a few different types of glue. The nail polish is used to cover the band once the design is in place and create a protective shell, though I’ve seen other MagicBand decorators specifically recommend base coat rather than regular polish. I’m not 100% sure what sort of clear nail covering we actually used, though it didn’t say ‘base coat’ anywhere on the bottle. As we weren’t sure yet how Gilly’s was going to stick, we also had rubber cement, spray adhesive, and super glue on hand. Gilly’s design, based upon “it’s a small world”, was printed on paper that would then be glued to the band. As I’ll explain later, this ended up being the wrong direction and we adjusted the project accordingly. I spent a fair bit of time deciding which order I wanted the logos to be in, before opting to cut them all out anyway and apply them individually. After printing my design onto clear temporary tattoo paper (ordered from Amazon, as our local craft store didn’t have any) the plan was to apply them directly to the band, exactly like applying a temporary tattoo to skin. 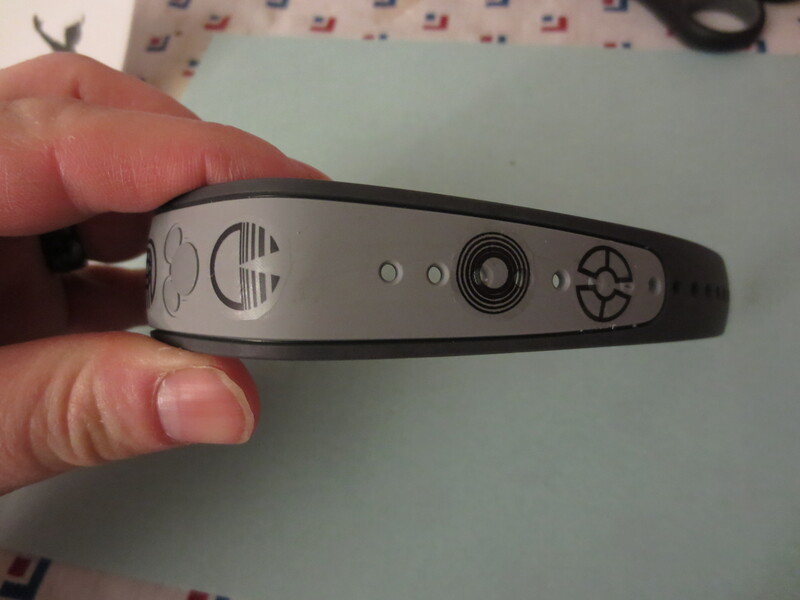 From there I would cover them with the clear nail polish to seal and protect the ‘tattoo’ on the MagicBand. Gilly’s design, printed onto window cling paper, was going to be glued directly to the band and then sealed with the nail polish. NOTE: If you’re using a direction-specific design, make sure you reverse if before printing it onto the tattoo paper! This didn’t matter for Gilly’s design, but the EPCOT logos should face a certain way so it was something we had to take into account for mine. The tattoo paper has a clear cover layer that comes off. The design side is pressed to the band, a wet paper towel is applied to the back for 10-15 seconds or so, and then the white backing slides off. The end result? A “tattoo” on your MagicBand. Like I said earlier, there was some trial and error involved in the process, and once we cut out our designs and it was time to apply them directly to the bands we learned this pretty quickly. Nothing that couldn’t be fixed and reworked, fortunately. The first thing we did with Gilly’s was use a bit of rubber cement to hold it down, but this proved to be ineffective and just caused the paper to buckle and the whole thing just looked bad. We then moved on to the spray adhesive, which stuck a bit better but still didn’t really work. 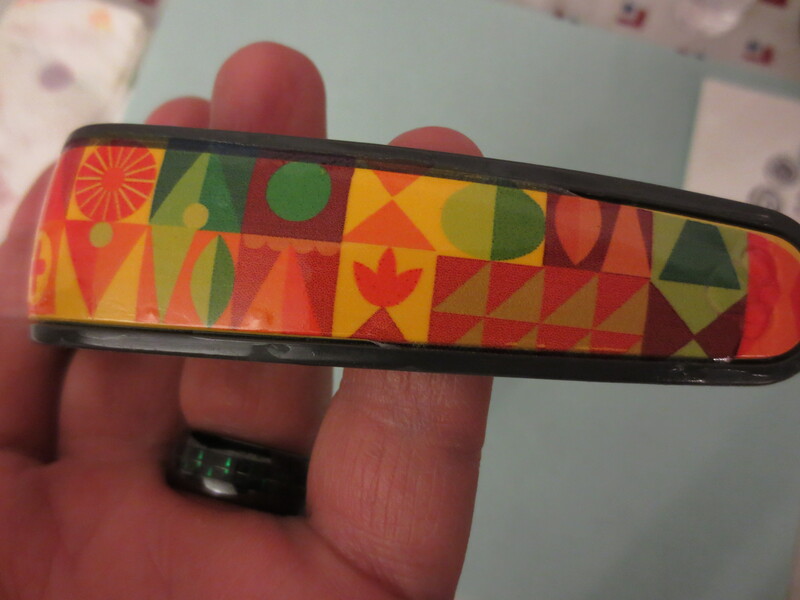 The main issue, really, was that getting the paper to adhere to the shape of the MagicBand was really difficult to do. If you look closely you can see that the paper separated from the MagicBand in a few spots, and even where it’s closely adhered it’s still a piece of paper glued to the rubber of the band. We knew that this simply wouldn’t hold up. I was having some difficulties of my own. While the temporary tattoo paper worked really well for applying my cut-outs to the band, what I didn’t anticipate was how hard it would be to properly place and space the individual logos. Because I was placing the design-side of the paper against the band, all I was seeing was the white backing and was essentially working blind when it came to the orientation of the round logos. I tried marking the top and bottom with a pin, but it never really worked out as I had hoped. You can see here that the Horizons logo (closest to the Mickey head) is crooked, as is the Communicore logo (down at the bottom). The Universe of Energy circle doesn’t have an up or down, which is good, but it’s clearly not in the same line as the others. So we were both going a bit off the rails, but it wasn’t too hard to correct any of the mistakes we had made thus far. Gilly was able to pull up the paper and use a touch of Goo Gone to get the glue residue off of her MagicBand, and a bit of water and scrubbing took the temporary tattoos cleanly off mine. We would have used a bit of rubbing alcohol, which the tattoo paper instructions recommended for removal, but we didn’t have any on hand. My new plan was to cut out the logos in a strip, rather than individually. This would allow me to apply them together rather than fight to get the positioning right. Gilly opted to reprint her design on the temporary tattoo paper, as I had been having decent luck with getting it to stick and liked the way it looked on the band. Keeping the logos together made things considerably easier. 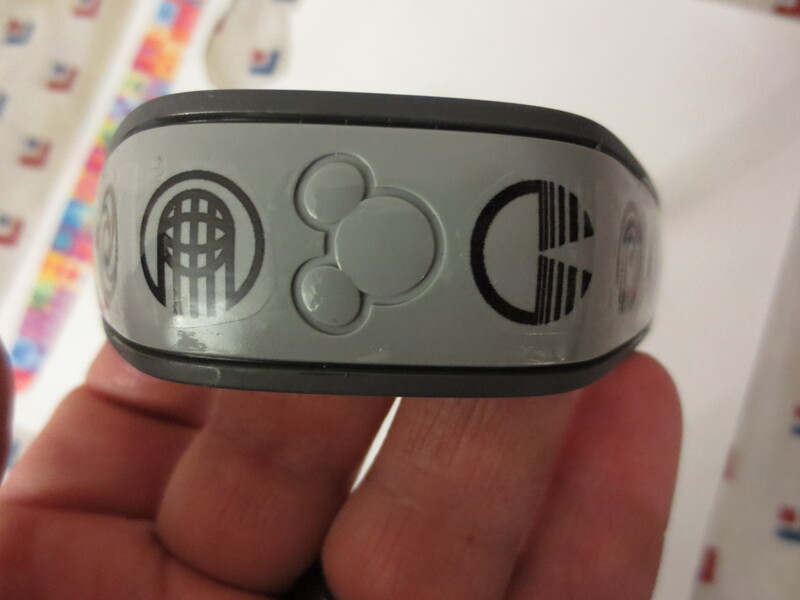 I cut them into two strips (of four logos each) to go on either side of the center Mickey head on the MagicBand. We reprinted the “it’s a small world” band onto the tattoo paper, as well as some backups of both designs in case of more issues. As to not waste the sheet of paper (it can’t be reused, and it can be a little pricey) we also made up some other fun temporary tattoos. Now that we had gotten our major mistakes out of the way, things actually went pretty smoothly. The application of my temporary tattoo strips went really easily, far easier than trying to apply each symbol individually. 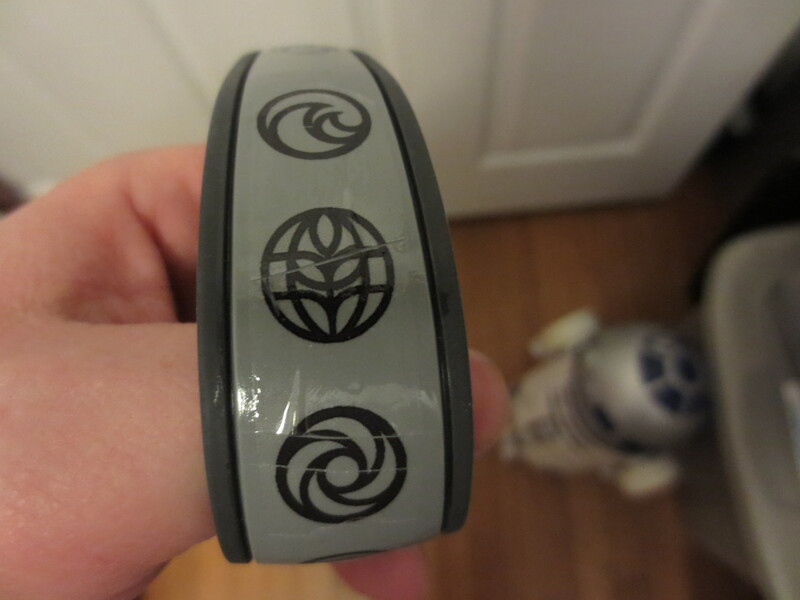 Gilly’s was a bit tougher simply because of the size of the tattoo and precision needed to get it onto the MagicBand properly, but it still went way easier (and looked better) than the original paper-and-glue method. 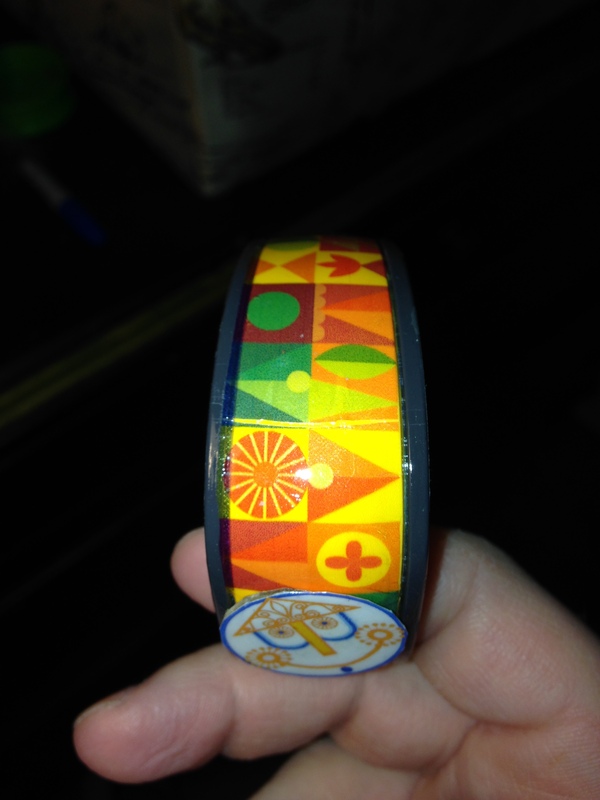 Using the tattoo paper makes the design look like it’s printed directly onto the band, and it’s probably what we’ll use should we do any more MagicBand art projects in the future. The tattoo paper wasn’t as bright as the original window cling paper–the colors were slightly muted from the first version–but it looked like it was really a part of the band rather than a piece of paper glued on. Had we planned for this, Gilly would have put down a layer of white nail polish first–applying the tattoo over that–to help the colors pop a bit more. 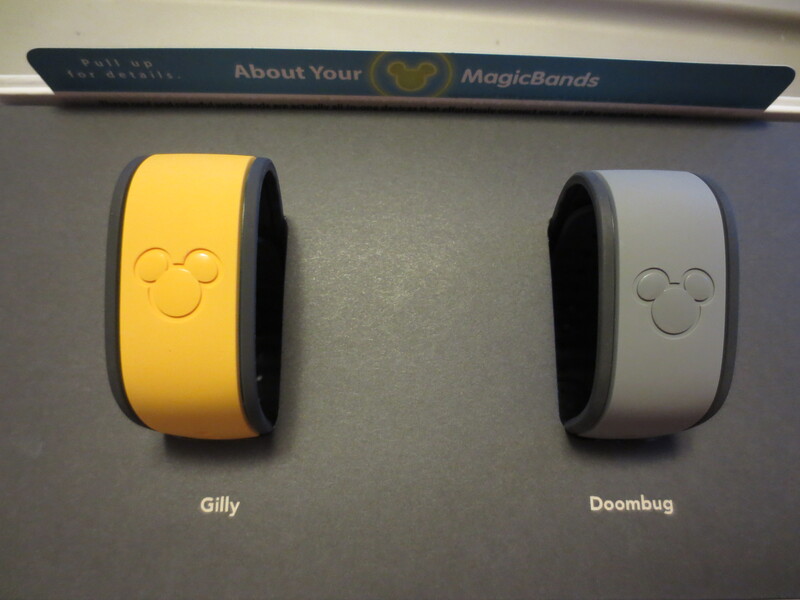 However, the bright yellow of the MagicBand did help. A darker color may not have worked as well. After the temporary tattoos had dried, we applied a couple coats of the clear nail polish to seal and protect them. The secret here is just going slow and being careful; too much and it’s going to get gloppy and messy, but too little and you won’t be doing any good (and could potentially scrape the tattoo with the brush). I recommend having a really good light source over the project, too, as the polish dries quickly and you’ll want to see where you’ve already covered. For this part we took turns ‘painting’ our bands while the other held a flashlight over it. The only caveat with the temporary tattoo paper: if you move too much while pressing the wet paper towel to the paper during application, you can wrinkle the tattoo. So being careful is key. It wasn’t as big an issue on mine, as I was using two smaller tattoos on the flatter sections of the band, but with Gilly’s we ran into this problem. You may also want to use a toothpick or something to carefully tuck any excess tattoo paper into the groove around the edge of the band. Gilly’s tattoo got a bit wrinkled during the application process. It’s actually difficult to keep it still (as the paper backing starts to come off, it wants to slide) and if it does happen there’s not much recourse other than just dealing with it or wiping it all away and starting again. Fortunately we were lucky in this case, as we still had to apply the clock face and it was going right over that wrinkled spot! For the clock face, Gilly kept the original printing that she had done on the window cling paper (though really any thick paper stock would probably be fine). She glued it to a piece of thin cardboard for stability and covered the front, back, and sides with a few coats of the nail polish to seal it and make it water resistant. 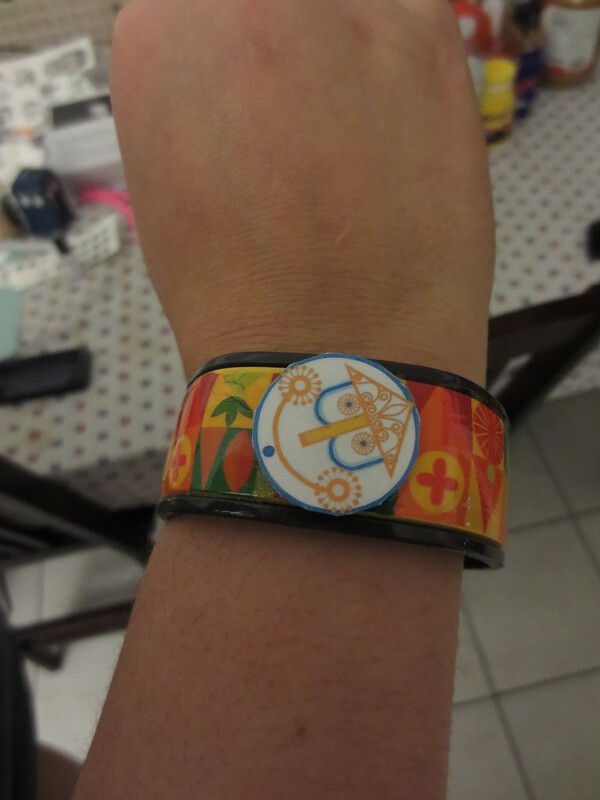 She then used a couple drops of super glue to attach it to the MagicBand. The separate clock face gives a 3D pop to the band, and also really completes the “it’s a small world” motif. It also, as luck would have it, covered the wrinkled section of the tattoo nicely. 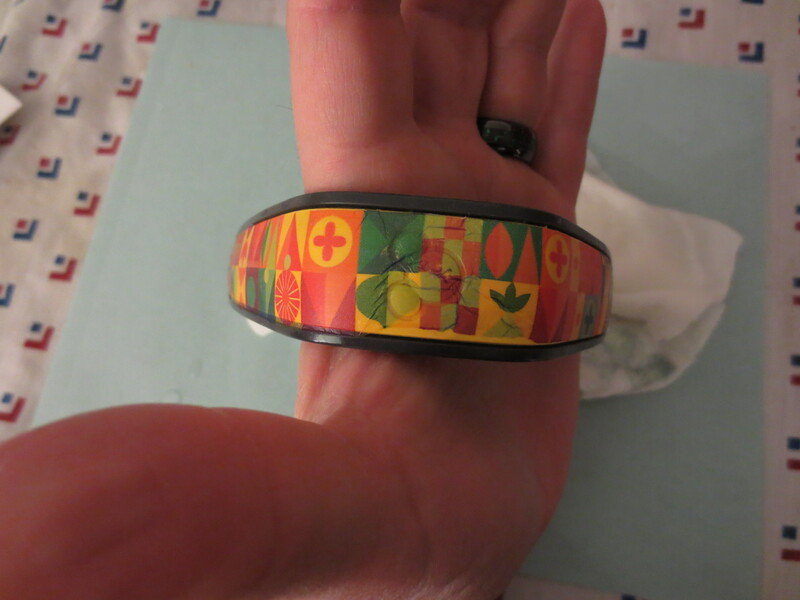 Originally I had picked the orange MagicBand, before I had a clear mental picture of how I wanted to decorate it. As the design came together, though, I felt that the more muted grey would be a better fit to the classic EPCOT Center theme. I also considered a few different ways to decorate the Mickey head, but opted to leave it alone. We did find that there was some cracking of the tattoos, once everything had dried and we put the bands around our wrists. Whether this is due to the tattoo paper itself breaking (which is my assumption) or the nail polish coat cracking and taking the design with it, I can’t say for sure. It’s not a major issue, but it happened. Once I bent the band into the shape it will be while on my wrist, there was some cracking on a couple of the logos. It’s not the end of the world, but it’s something I’ll have to keep in mind and compensate for (or solve) on any future MagicBand projects. Remember when I said how important the base color of the MagicBand can be? If you look closely you can see a crack in Gilly’s decoration, but since the design has a lot of yellow and the band itself is yellow it’s barely noticeable. 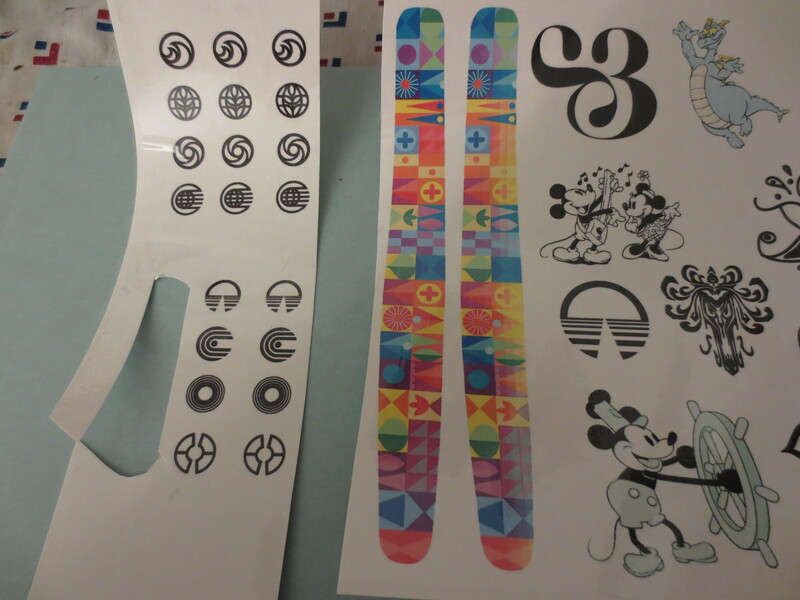 The original EPCOT Center attraction logos! 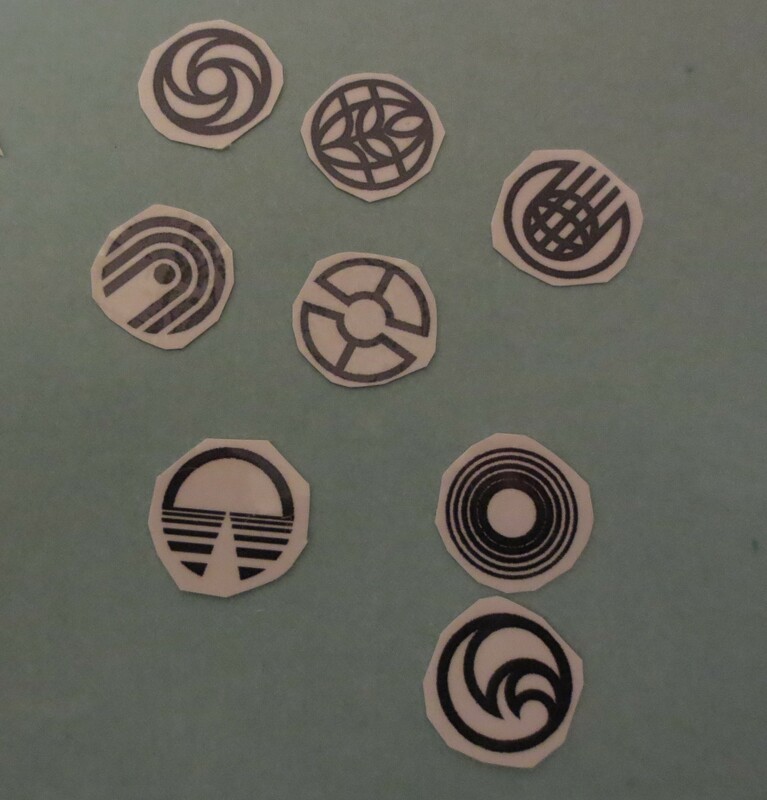 On the left, starting below the Mickey: Horizons, World of Motion, Universe of Energy, and Communicore. On the other side, top to bottom, it’s: Living Seas, The Land, Journey Into Imagination, and Spaceship Earth. Gilly’s, based on “it’s a small world”, is hand-drawn by her using the art style of the attraction. The clock face, which is a major part of the ride’s beginning section, pops off the band slightly to give it a 3D effect. Keep in mind the holes! Check the circumference of the band when it’s around your wrist so you know where you’ll be attaching one side to the other when wearing it. We only applied our decorations and nail polish to the colored part of the bands, and fortunately when they’re on our wrists we’re using holes that are beyond these portions. 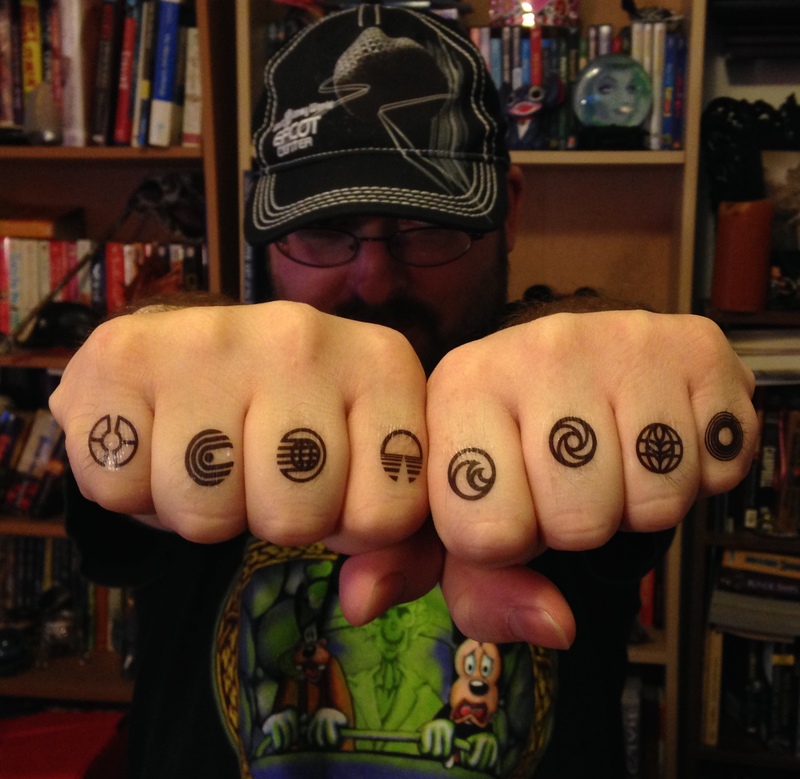 If we had smaller wrists, we’d have to consider punching through the holes that are covered by the tattoo designs. For Gilly’s this probably wouldn’t have been a big deal, but for me it would have affected where I put the logos. We’d then have wanted to make sure to get the nail polish sealant onto the inside of the hole, to prevent moisture from getting under the tattoo from those edges. Here they are, all ready to go! Once they were done, all that was left was to wear them to Walt Disney World! 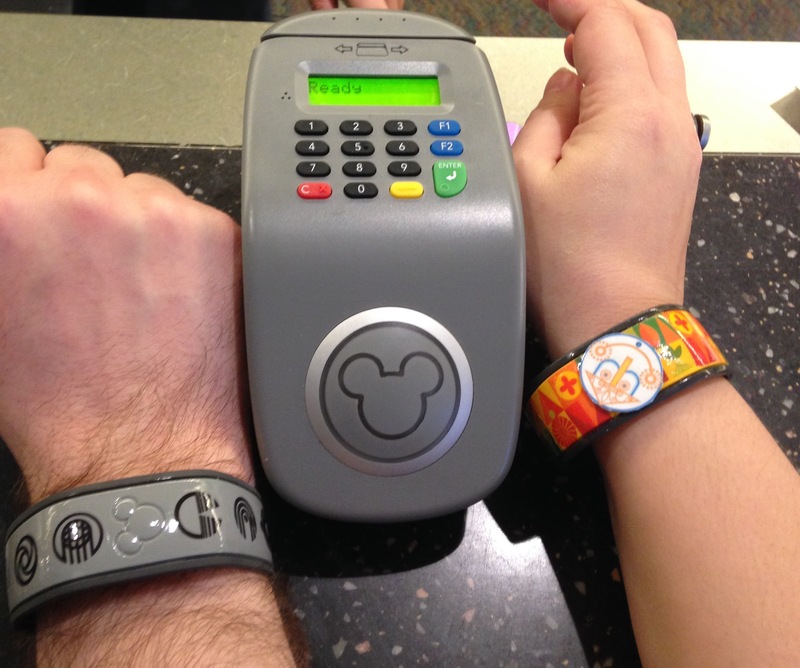 Given that MagicBands are your room keys, park tickets, payment method, and more, you end up wearing them all day. Fortunately, ours were so cool we didn’t want to take them off anyway. 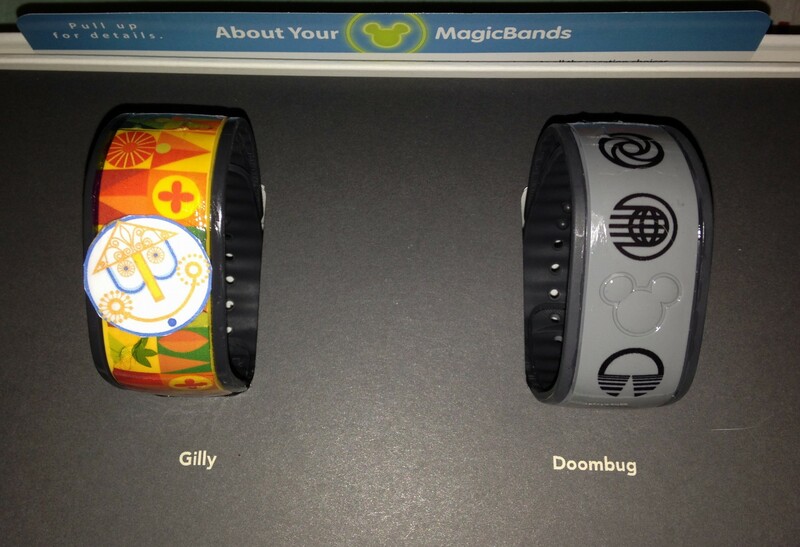 These MagicBands were definitely noticed! Gilly’s stood out more and got lots of compliments–at one point a cast member was gushing over it and called over two more so they could see it–and mine certainly got great comments as well (and nods from other fans of the classic EPCOT design). They held up well, too. They got rained on one day and got pretty wet, but the nail polish protected the designs from harm. It was also a bit chilly at times, so we were wearing hoodies, which meant that those sleeves rubbed a bit against the bands–especially when we would pull the cuff up to access them–and I never noticed any problems from that in terms of damage or wearing anything off. We never went into a pool with them, so I can’t say for sure what (if any) effect chlorine may have, but I did dunk mine on the last day and didn’t see any immediate issues. Outside of the cracks that developed during the decorating I can’t really see noteworthy damage from being worn and used in the parks. The clock face on Gilly’s is still attached, too! All in all it was a fair bit of work, but we’re extremely happy with how our decorated MagicBands came out and the great reactions they got from cast members in the parks. We learned a lot about the process, came up with some cool ideas for next time, and making them was a lot of fun even with the occasional mishaps. Oh, and remember those extra temporary tattoos we printed out? UPDATE: We’ve had a lot of people really respond to Gilly’s “it’s a small world” band and have asked where/how to get that design. It was an original work by Gilly based upon the art style of the attraction, and she’s decided to let people use it if they are so inclined. If you follow this link you’ll find a .pdf of the design. Did you follow this method to create your own MagicBand art? I’d love to see! Post a photo on Instagram and use #MagicandMisadventures to show off your work! 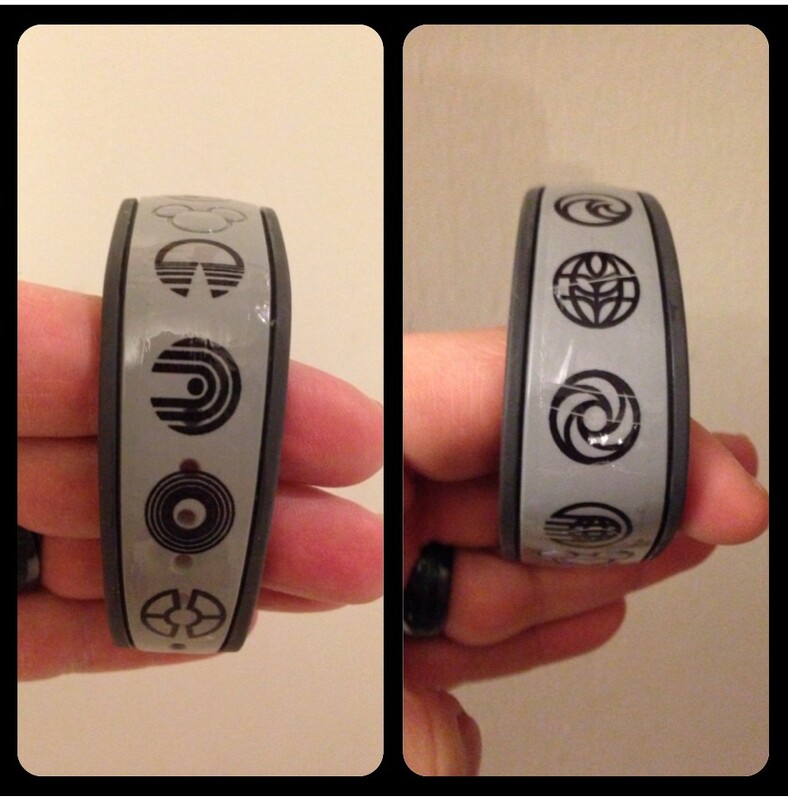 This entry was posted in Do It Yourself and tagged Disney, DIY, MagicBands, Walt Disney World. Bookmark the permalink. 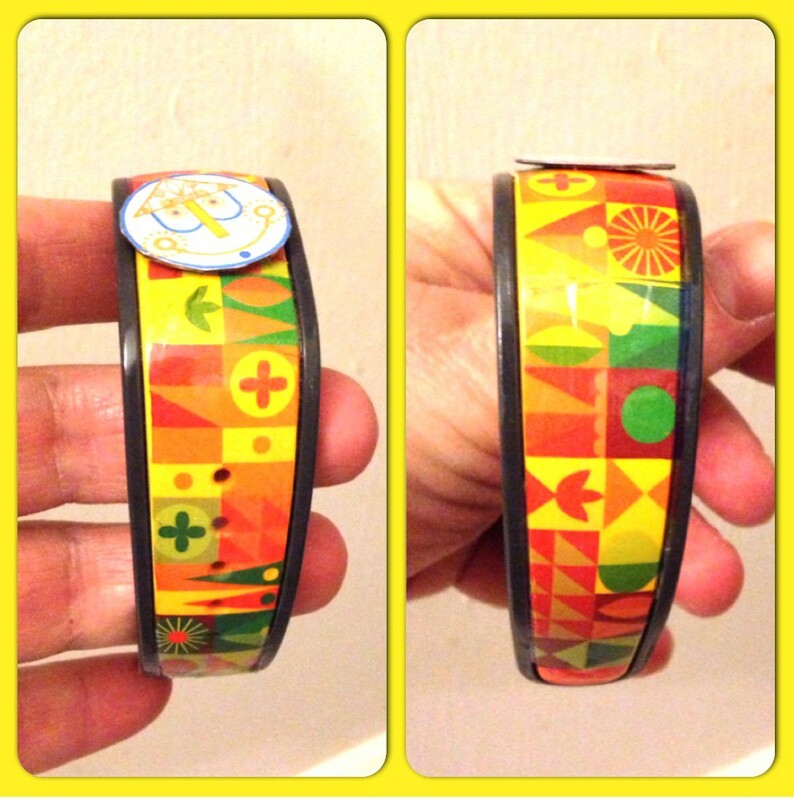 Awesome instructions on how to decorate your MagicBand. Great tips, great photos, and yet another great use of the all-powerful Goo Gone. No matter the art project, having Goo Gone nearby is a must.